In the year AD 117, the Emperor Trajan was in Selinus, or modern day Turkey. During the past nineteen years, Trajan had conquered the regions of Parthia and Dacia and had started building programs in both Italy and Spain. Trajan is most famous, though, for his tolerance of Christians. This fact earned him a place in Dante's Paradiso as the only pre-Christian Roman emperor. While in Turkey, Trajan had a stroke and died at the age of 63. On August 8th, 117, Hadrian, Trajan's adoptive son, inherited the throne. Hadrian's method of ruling was to improve rather than invade. Hadrian is responsible for many of the most recognizable buildings in all of the Roman Empire. Among his works is the Pantheon in Rome. Though it was constructed more than a century earlier, Hadrian had the Pantheon renovated, adding the 141 foot diameter dome to the structure. Hadrian also constructed the Castel' Sant'Angelo and a villa at Tivoli, both of which still stand today. Hadrian is most famous for his wall, which began construction in AD 122. In the north of Britain, the Picts and the Scots continuously raided cities in the Roman-controlled region of the island. To halt these raids, Hadrian began the construction of a wall, known as Hadrian's wall. This wall was ten feet wide, fifteen feet high, and stretch 73 miles from one coast of Britain to the next.. The wall also had a fort every five miles. Hadrian's Wall remains the larges construction project in Great Britain and it was the first barrier to set a distinct line between what would become England and Scotland. 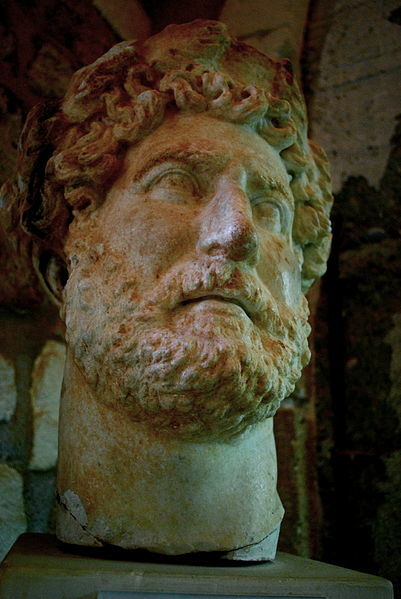 Hadrian continued building until his death in AD 138, at the age of 62.